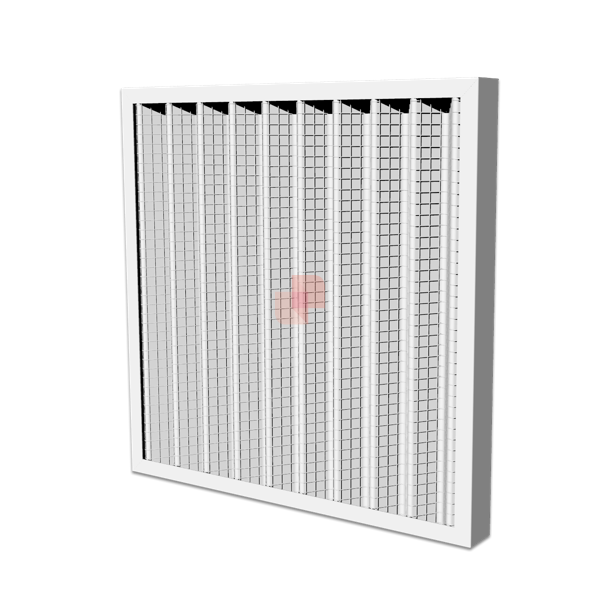 Pleated metal Panel Filter for pre-filtration and coarse dust separation in air handling units (AHU) for ventilation, air conditioning (HVAC) systems. The Metal Pleated Panel Air Filters consist of synthetic fiber polyester filter media, galvanized sheet metal frame, welded steel support mesh. the galvanized sheet metal frame, closed on one side with rivets, can be easily opened to perform the differentiated waste disposal. The pleated filtering cells with metallic frame are used in the pre-filtration and separation of coarse dust, such as pre-filters for high efficiency or absolute filters in ventilation and air conditioning (HVAC) systems, in air handling units (AHU). Pleated Panel Filters and Filter cells with polyester filter media have efficiency Class G4 according to EN779:2012 Standard for Air Filters.